Nothing says "Man Cave" like a bunch of onions strung up in old pantyhose hanging from the wall. I have a problem. I am rough on pantyhose. Like really rough. In reality I roll up the tights into somewhat of a donut and stick my foot in the toe and from their it gets dicey as I attempt rolling the tights up my legs only to have them twist and turn...ugh... there is no graceful glide - more of a violent struggle. It's not pretty. As you can imagine, I go through hose fairly quickly so it is a good things that a. I wear them very infrequently and b. I have found other uses for them. After the 4th time out, runners are everywhere and the hose are weblike and being held together by a glue of clear nail polish so it's time to find another use for them. Store Onions (see photo above)- This is something my Momma taught me. Drop an onion down in the toe of the hose and tie it off. Drop the next one down and continue dropping and knotting until one leg is filled then do the same to the other leg. 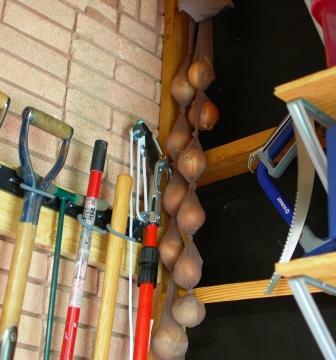 Hang them up in the garage or shed or wherever you store onions. They will get ventilation so they won't go bad and they are conveniently ready for you whenever you need them. When you need one, you cut under the bottom knot and release an onion. It's genius. Play a Game - At my 17th birthday party, a good friend of mine took over the entertainment part of the evening and we played a game (outside of course) where two of us dropped a tennis ball into the toe of the hose then we put the pantyhose on our heads. We swung the tennis ball dangling from the hose around like a helicopter. The objective was to get your propeller tangled in their propeller so you could pull their propeller completely off their heads. It was hysterical to watch and fun to play. Also, I have played a Minute to Win It game doing something similar with a tennis ball in the toe of the tights with the tights on my head and I had to knock over so many bowling pins using the ball like a pendulum. Tie Back Your Garden - If you are into square foot gardening, then you know that Mel says you can grow melons and winter squashes vertically instead horizontally. All you need to do is basically make a cradle for the melon or squash using pantyhose. You can also use hose to tie back your tomatoes and peppers. Sachets - Remember the natural bug repellents? Well, you could always make sachets using a couple of those different dried plants and the less holey sections of the pantyhose. Keep Roots from Your Pipes - To deter tree roots from growing in your sewage pipes, tie up some pennies in a knotted section of stockings and keep the copper sachet in the tank of your toilet. Every time the toilet flushes, a little of the copper is eroded away and is flushed down the pipes making it uninhabitable for the roots. Do you have any great ideas using spent pantyhose? If so, I'd love to hear them. Really interesting tip about the tree roots! I store onions that way too. If your washing machine's drain hose empties into a sink, lint from the laundry can clog the drain. Put old pantyhose over the end of the hose and tie it tightly at the top. It will catch all the lint from 5-10 loads before it gets full and needs to be thrown away.